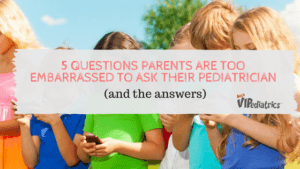 Boca Raton Pediatrician, Chad Rudnick, MD weighs in on questions he receives from Boca Raton parents via email and text that they’re sometimes too embarrassed to ask in person. 1. How much TV can my child watch? This depends on the age of child. Ideally, television and all screen time is limited to allow the child to play outdoors and indoors while using their imagination. The American Academy of Pediatrics recommends avoiding screen time for children less than 18 months of age except for video chatting. Children 18-24 months should have high-quality programming to watch (avoid those pointless egg opening youtube videos). Talk with your child about what they are watching and reinforce the educational material presented. Children 2-5 years should limit screen time to 1 hour per day of high quality programming. In a recent study, preschoolers who watched the Daniel Tiger series and then had their parents reinforce the themes (ex: sharing with others, dealing with frustration, etc.) had higher scores on empathy compared to those who did not watch or didn’t have their parents talk about the show with them. It’s important to encourage media-free times together (ex: family dinner) and parents should always be aware what shows their children are watching to ensure that the content is acceptable for the child’s age and maturity level. 2. My child won’t eat any vegetables. How will this affect their health? Nearly all parents go through this, so just know that you’re not alone. Just because they refuse to eat their veggies, doesn’t mean that you don’t offer them at every meal. Getting creative with sneaking in veggies into the foods they love is a great way to get some of the great vitamins and nutrients from veggies. Additionally, there are veggie powder blends that can be added to nearly any food or drink to get some “greens” into their diet. Overall, kids do just fine with being picky eaters. What we want to avoid is giving in and only serving high fat/high calorie foods (think French fries, cookies, cakes, etc). 3. I’m breastfeeding. When can I go back to getting botox? Because it is not 100% safe, botox should be avoided while breastfeeding. 4. My child goes to bed really late. How can I change this? Change their schedule — and your schedule! Start by moving bedtime up by 10-15 minutes every 1-2 days until you get to the bedtime that you’re aiming for. For toddlers, that means dinner, bath, story time, and nighttime bottle or sippy cup must be moved up as well. Even if your child doesn’t fall asleep right away, they still should be put to bed and have the lights off. For those that are old enough, re-iterate that nighttime is quiet time and start winding down their activity 30-60 minutes before bed. Children should not have a TV in their room that is used to fall asleep. Older children should keep their phones off (or not even in the room with them) when it’s bed time. 5. My child has gained weight. What should I do? First thing to do is start by evaluating their eating habits and exercise levels. Kids’ bodies are always changing and weight gain is normal, but when it comes in excess or higher than what is expected for their age and height, simple steps can be taken. Because kids are not going to the grocery store to buy food, parents can take away the “bad” snacks available in the house and replace them with fresh fruit and nutritious snack options. Your child may not like it at first, but with time they will start to eat the healthier options.